This page will share the information about Windows Server 2008 hard disk resizing when C drive is running out of disk space with r2 or sbs included. Download IM-Magic Partition Resizer Server to extend C drive on Windows Server 2008. It is easy to use and risk-free. When you check the disk managment, you may find out that the Extend Volume grayed out for the c drive boot partition. Probably Windows Server is telling us that this partition is very important and cannot be resized for the OS security. What if you just need to expand the c drive? Here is a 100% safe program called IM-Magic Partition Resizer Server which enables you to extend C drive on Windows Server 2008 without touching the data&OS stored on C drive, so you can totally rely on this partition software when Server 2008 shows low disk space warning on C drive. Since it has ROLL-BACK TECH to ensure the safety. How to Extend Server 2008 C Drive? Right click a large partition to produce free space. Redistribute the free space to c drive. Move the arrows when mouse shows double arrows symbol and then click "Apply" button. How to Produce Unallocated Space? 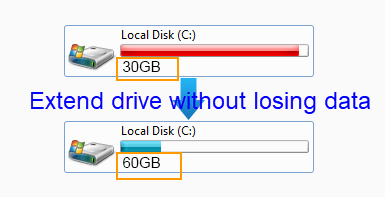 If there is existing unallocated space on the hard disk, you just need to move it close to C drive so that you can extend C drive. If there is no existing unallocated space, you can produce some by deleting or shrinking a partition. When you delete an existing partition, the partition will be lost and it will be shown as unallocated space on Disk Management. However, all data on the partition will get lost when you delete it. Therefore, you can shrink a partition to squeeze some unallocated space without losing any data. Usually, you can open Disk Management or rely on IM-Magic Partition Resizer Server to shrink a partition. After shrinking the partition, you still need to move the unallocated space close to C drive. 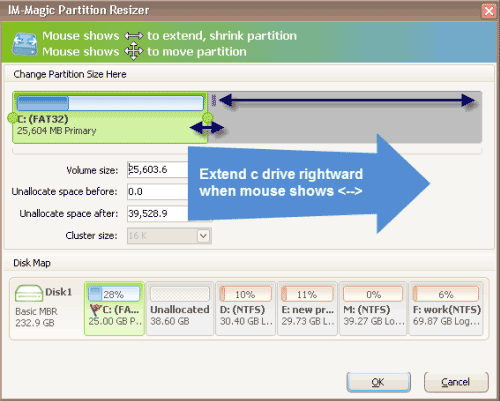 Only partition software like IM-Magic Partition Resizer Server has the function of moving partition.